The thousands willing to march in the pouring rain at Melbourne’s Palm Sunday rally was a sign of the solid commitment and growing reach of the refugee campaign. But for a month in the run up, two organisations, RISE and Democracy in Colour, tried to sabotage the rally. Their social media offensive against the Palm Sunday committee, pushing for RISE-approved speakers, portrayed themselves as the only authentic voices of refugees and tried to pit “refugee voices” against the activism of non-refugee activists. Such mistaken and divisive identity politics can only weaken the refugee campaign and has the potential to confuse, demoralise and demobilise the campaign. RISE charged the rally organisers with excluding refugee voices, demanding a platform for six speakers determined by RISE. The committee had already decided on and invited speakers, including refugee speakers, at meetings that, although invited, RISE had not attended. Insisting that three out of nine refugee speakers was not enough, RISE members and supporters pressured non-refugee speakers to withdraw. Ultimately, RISE was offered a speaking slot. But tragically the RISE speaker used the platform to accuse the refugee campaign of being a racist force holding back refugee empowerment and to call for an apology from the committee for silencing refugees. RISE is a refugee run organisation in Victoria, which does admirable work supporting asylum seekers’ claims and providing support and welfare services. But it has an ideology of extraordinary hostility to other refugee campaign groups. RISE’s identity politics lead them to believe white people will inevitably fail to show solidarity and contribute to racism against refugees. One statement on their website claims: “it is not only the governments; the refugee sector has polarised us and damaged us. It is about their interest rather than our lives—what have we achieved last 20 years in Australia? NOTHING—because the refugee sector is headed by non-refugees”. This position sets RISE at odds with all the pro-refugee actions and activities of the refugee campaign. RISE does not endorse or promote Palm Sunday rallies, or other major refugee mobilisations. It discourages its members from speaking at events not organised by RISE, and boycotts Refugee Week. Racism in the refugee ‘sector’? Their anger directed at the “refugee sector” prompted many to ask does the campaign silence refugee voices? The truth is, there is a refugee leadership on Manus and Nauru, and also amongst communities such as the Tamils, Iranians, Hazara, Iraqis, Sudanese, Somalis, Kurds, West Papuans and others. The stronger the general refugee movement is, the greater is the political space for them to organise and have their voices amplified. 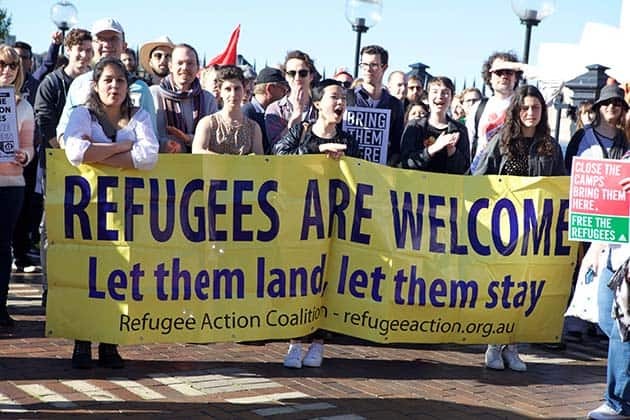 Palm Sunday rallies, and forums and meetings organised by many sections of the refugee movement throughout the year, build platforms for refugee activists that go far beyond the one rally itself. RISE’s mistaken view denies the possibility of genuine solidarity between refugees and supporters, and frustrates the efforts of RAC and other groups orientating to the potential power of working class opposition. Where the movement is fighting the government’s brutal policies and trying to cultivate the seeds of anti-racist actions among unions and workers, RISE sees only inadequate gestures that must be “called out”. Following the turning point at Lady Cilento hospital last year, where hospital workers refused to release baby Asha to be returned to Nauru, RISE issued a statement condemning hospital workers as hypocrites and cowards. Instead of encouraging nurses and doctors to replicate and redouble the Lady Cilento action, RISE dismissed them as “talking loudly” against detention, but failing to genuinely support refugees. More recently, the Australian Nurses and Midwifery Federation issued a statement condemning the deportation of a refugee to Iraq, and called on members to attend the protest vigil. Instead of building on the nurses’ stand and offering support, RISE accused nurses’ union members of hypocrisy and “aiding deportations”. Some refugee activists gave into RISE over the Palm Sunday rally. But offering RISE a speaker in the face of their social media attack was a mistake. This can only encourage RISE and DiC to continue with their self-defeating and destructive politics. RISE sees “white supremacy” in one of the very ingredients the movement desperately needs: initiatives from people of every background at a grassroots level to fight anti-refugee racism. It is impossible to build a successful refugee campaign that does not promote the voices and leadership of refugees—the horrors asylum seekers experience underpins the campaign against racism, mandatory detention and offshore processing. With its roots in the refugee community, RISE could play a significant role in the movement. But the approach that labels the refugee campaign as racist and refuses to see the potential of working class solidarity means it undermines the potential to fight the anti-refugee policies of both main political parties and to win real change. RISE’s attacks on the refugee campaign should be opposed. Such an approach can only help the real racists in the government that oversees the torture of asylum seekers and refugees.